Six years ago, almost to the day, I remember sitting on the couch with my then one-year-old son playing Elebits on the recently launched Wii. I thought he’d understand the simple point-and-shoot game. It was sort of a shooter. You walked around a house and aimed at the little characters. He was enthralled. I was a new parent and I was showing him the magic of the Wii – Nintendo’s standard-definition console effort that appeared after years of relative stagnation and, more important, the launch of new consoles from Sony and Microsoft. This oddly underpowered console somehow survived to sell 97 million units, 20 million more than its competitors. The Wii is going away and the Wii U is about to take its place. And I would say – and this is saying a lot – that my oldest boy, the son I played Elebits with, has spent most of his childhood on the Wii or the DS or the 3DS and Pikachu, Mario, and Link are as familiar to him as his own grandparents. That is the Nintendo’s power. The Wii U launches today and the old familiar franchises are here – New Super Mario Brothers U is probably the most anticipated title but Nintendo World, a set of franchise-themed mini-games. It is certainly a fun console that is very reminiscent of the Wii. But now Nintendo has Mass Effect 3. It has Batman Arkham City. It has a zombie game that involves splattering the undead. In short, this HD console is now a hard-core gaming machine and Nintendo’s clear hope, in the end, is that those who come for the nostalgia will stay for the wider world of gaming. After all, Nintendo is up against massive competition. The world has passed Mario by and Link has been replaced by the Mighty Eagle. What is a dream factory to do? With the Wii U, their latest console, they’re doubling down on the future. In short, Nintendo is changing. And that’s OK.
Here’s the primary question we’re trying to answer tonight: is the Wii U worth buying? Yes, but with the caveat that you should expect new consoles from Sony and Microsoft in the next two years and if you’re primarily a Sony or Microsoft gamer (or a PC gamer) you may want to give this console a miss. However, it’s a fun console for families, folks with big groups of friends, and nostalgists who can’t miss the latest Metroid installment. In short, like the Wii before it, the Wii U aims at multiple demographics, misses many, but hits just enough to matter. Which one should you buy? The $349 32GB unit is probably the one you should be looking at because, as the Wii Market ramps up, it should be interesting to see what content becomes available. The $299 8GB version has just enough space to be dangerous (and keep in mind that you can add SD cards and USB storage to the device later) but you’ll want to future-proof things as you’ll probably be holding onto this thing for another six to eight years. That said, let’s explore the console and some of the interesting changes that are afoot in the Wii U. The first thing you’ll notice about the Wii U is that it comes in two parts. The console itself is a squat black box, about the same size as the original Wii, but with multi-gigabytes of built-in Flash storage and four USB ports. It supports HDMI and component video, runs an IBM Power processor with AMD Radeon GPU, and is compatible with the original Wii games. It is supposed to output 1080p video, a vast improvement from the Wii’s original 480p capabilities. This is a fully modern console with fully modern specs. I’ll spare you a rundown of the various physical aspects of the device simply because I’m sure they will be addressed ad nauseum on various gaming sites this week. The console itself in fact is the least interesting aspect of the Wii U package and the main UI, represented by icons that appear either on the included touchscreen GamePad or on the TV screen, is as uninspiring as a iconographic OS can be. The real draw is the Wii U GamePad. Looking at the GamePad you can see a sort of elongated game controller with two analog sticks at the top corner, directional pad on the left, four buttons on the right, and a set of four shoulder buttons. In the middle of the controller is a 6.2-inch color touchscreen that supports gyroscopic motion controls and includes a camera and microphone. The console, when connected to speakers, plays music in concert with the GamePad, sometimes to interesting effect. When you’re playing a game on the Wii U, various things appear on the touchscreen. In some games you see the on-screen action copied on your GamePad. 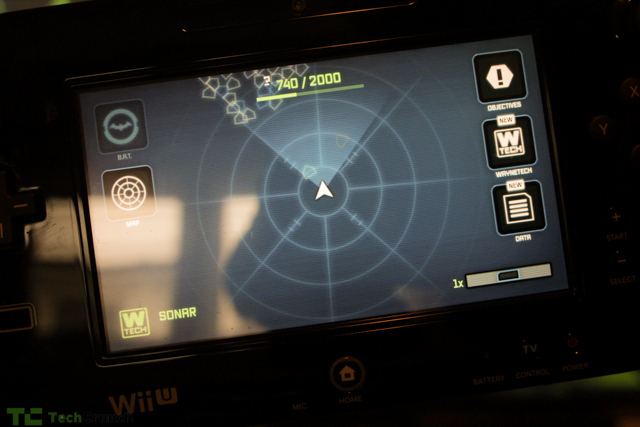 In other cases special information appears there – Batman’s radar, inventory selection screens, menus. You can also connect classic Wii controls and the GamePad user can lord over the regular users in various games. For example, one game in Nintendo World turns the GamePad user into a ghost and the rest of the players into hunters. The ghost can see everyone but no one can see the ghost. The GamePad also has NFC technology built in and lasts about six hours of gameplay on one charge, although your times may vary. The GamePad is Nintendo’s way to combat the increasingly powerful and increasingly portable gaming devices we now carry with us. Although there is no Legend of Zelda for the iPad – yet – that’s not to say that a developer will send time and attention to that platform, eschewing the dog-eat-dog world of console games. With big-name titles reaching astronomical budgets and rivaling Hollywood in sheer manpower dedicated to a game, it’s clear that Nintendo’s brass feels its fighting an uphill battle for attention and, more important, game revenue. The GamePad, on the other hand, acts as an attention sink. You focus on it when playing, you can turn off your TV and just play some games right on the GamePad, and the interface is so mobile-esque that the Sing It game is reminiscent of the iOS music player. Just as mobile design aesthetics infected Windows 8, so too does the GamePad follow many of the design quirks of a mobile device. Playing on the GamePad is as comfortable as playing on any other game controller. I would wager that even the Wii’s rectangular Wiimote was a less ergonomic device than the GamePad. It works well as a primary controller, although battery life could be better, and works even better as a sort of “overarching” controller that a “master” game player uses to hound the other players. It is this unique game mechanic – heretofore unseen in a shipping console – that makes the Wii U so compelling. Whereas the Wii got you off the couch to play ball and bowl, the Wii U realizes you’re probably not moving so it might as well replace the Internet devices that are drawing you away from the TV in the first place. The Wii U’s television graphics are, if not amazing, on par with current console offerings. Most of the ports – and many third-party titles are ports of older games – are acceptably similar if not indistinguishable from the versions that appear on other consoles. It’s this me-too nature of the games catalog that could put off some players, as they’ve most probably already played these titles before elsewhere. 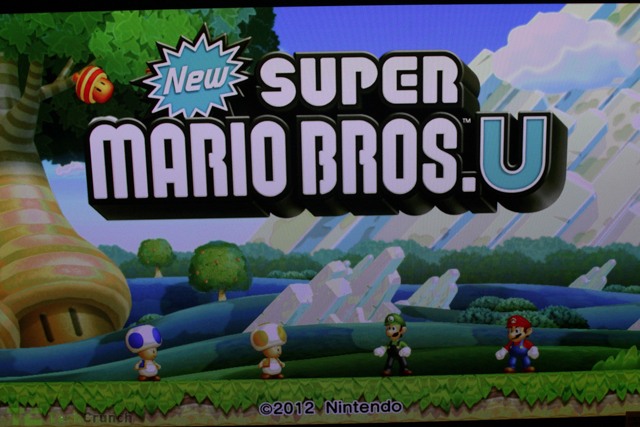 Nintendo usually shines with its one first-party game, and the aforementioned New Super Mario Brother U is no exception. The game is played with a GamePad or multiple Wii remotes and it showcases the console’s graphics clout as well as GamePad/Screen interaction. You can, for example, view the entire game on the GamePad, eschewing the TV, or perform some moves on the screen and some on the controller. It is probably the best launch title available. That said, I would argue that the Wii U’s launch titles are fairly slim. Just as many of the Wii’s best titles didn’t appear until later, the launch lineup is a mish-mash of old favorites and only two really compelling franchise titles, Mario and Nintendo World. There’s a little bit of everything for everyone, but nothing that would make me say you must go out and buy immediately. This should change over the next few months. Again, I am loath to delve too deeply into these titles as we’re attempting a high overview of this game and an examination of its import on the gaming landscape. I’m not attempting to, say, convince you that the Wii U is better than the Xbox or PS3 or that this is the best Mario incarnation. You undoubtedly have your own heated opinion on this if you’ve read this far. In the pantheon on current consoles, the Wii U stands alone as the device that straddles childhood and adulthood. Simpler games will appeal to the youngsters while titles like Batman, Zombi U and FIFA Soccer, in all their HD glory, will keep older folks happy. Nintendo is striking a precarious balance here and I feel that they have, for the most part, maintained that balance. If Nintendo should have a single worry it’s that the world may soon move on past its ostensibly scrawny hardware and into uncharted territory. 4K resolution could be a very real thing in the next few years and the Xbox could soon have a second screen that runs on stock tablets around the house. Why do you need a bulky, awkward, touchpad controller when you can simply fire up an app on Windows Phone? I honestly don’t know the answer to this but I can say that the Wii U/GamePad experience is dedicated to gaming just as, say, Kindle Fire is dedicated to reading. There are some distractions in the form of YouTube, Netflix, and Hulu (all unavailable when I wrote this) but the key endeavor here is getting Mario back to Peach’s castle, come hell or high Bowser. I will predict that the Wii U will be the popular console of this season and it’s not for the reasons, say, Halo 4 is a must-have title. There is, for example, little online gameplay in the Wii U right now. I was unable to really test online play but it is ostensibly similar to the Wii’s Miiverse gameplay involving exciting troops of little Mii characters ostensibly interacting in real time. The console also has Wii U video chat services as well as a shopping service that allows you to download games to the console. Most of this is secondary and some of the games will actually use their own network play systems and bypass the Mii universe entirely. But network gameplay isn’t the draw here. The Wii U is a social gaming console designed for parties of like-minded folk to get together over a few rounds of Mario Kart in the same room. It is family gaming in an era when the family unit is stretched oddly thin. It is clearly backwards compatible with the Wii because all of the best games there – Mario Kart, Mario Party, and the like – will be the incumbent stars on this console and fun for mom, dad, the kids, the girl/boyfriend, and the revelers at countless house parties. Don’t think of the Wii U as a new console, think of it as the Wii grown up. So try the Wii U and I would recommend picking it up. At $349 it is hard to say that this is much more expensive than a tablet and far more social. The games will be pricey and the accessory sales will line Nintendo’s coffers for the next big console, and gaming will continue to evolve. But if you want to see a unique segment of that evolution, look to the Wii U. As we roll into the darkness of winter, the real test of the Wii U will be its effect on players who are endlessly distracted by tablets, PC games, and other visual entertainment. It will have to fight against Skyrim-addled adventurers for whom the Japanese RPG elements of the Zelda games are just a bit too non-Tolkienian. It will have to fight against consoles that have made their name with shooters and gore and guts. It will have to appeal to young and old alike. It will have to remain a hearth where dreams are wrought. Will it succeed? If this afternoon was any indication, my oldest son and his friend loved the Wii U. He’s come a long way from the tottering infant that stared intently at a 480p game involving animated electricity. He’s a boy now and he loves the Wii U for its interactive qualities, for his ability to be a master over visiting players, and his understanding of the game mechanics that he is familiar with through his gameplay on my iPad and iPhone, through mini-games on the laptop, and through the 3DS where he is a Pokemon master. He is excited. I think you will be, too. Nintendo could sell a million of these this year and hopefully another 9 million over the next few years. But could they falter here, with this odd mechanic and me-too graphics? Perhaps, but until then my son will slowly and surely wend his way through Mario’s dangerous world, and, when he and the Tokyo-based company are ready, follow Nintendo into a bright, strange future.